Remember that announcement of an HD port of Jet Set Radio posted some time ago. I’m not saying it’s dead, but after reading this you might be a bit concerned. Citing financial difficulties in the last fiscal year (which ended last Saturday), Sega has layoff many workers from both its U.S. and European branches and downsizing the company to maintain “sustainable profitability.” In light of this, Sega also mentioned that for these markets, they’ll now focus more on games that are sure-fire his for them including Sonic, Total War, Aliens, and Football Manager. This puts other projects in danger of cancellation or being left to fend for themselves, which include Virtua Fighter 5: Final Showdown, Anarchy Reigns, Yakuza 5, and the aforementioned Jet Set Radio HD port. 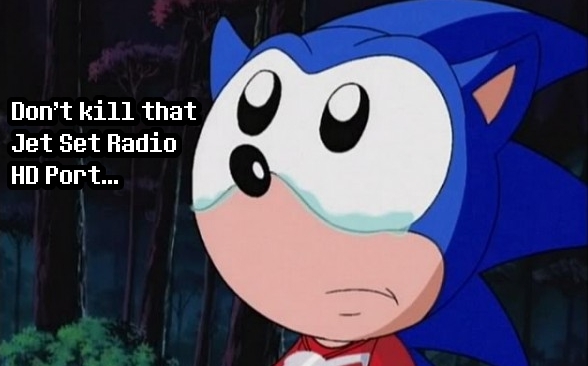 While Sega did mention that they have cancelled games, all of them so far are unspecified (i.e. never shown to the public). But still, this puts much concern on which projects Sega will give us now as they too are yet another victim of believing Westerners like their guns and football (save for Sonic). And the sad thing about all this: What they believe is right. The first quarter has ended. And so far it’s a sad year to be a gamer. Maybe those crazy Mayans were right. This entry was posted in Gaming News and tagged downsizing, jet grind radio, jet set radio, layoffs, money, sega, sega sammy, Sonic, virtua fighter 5, We're losing a lot of rings thanks to you. on April 2, 2012 by Steven T..